As I shared with you a few days back that Paul Smith has opened his third shop in India. 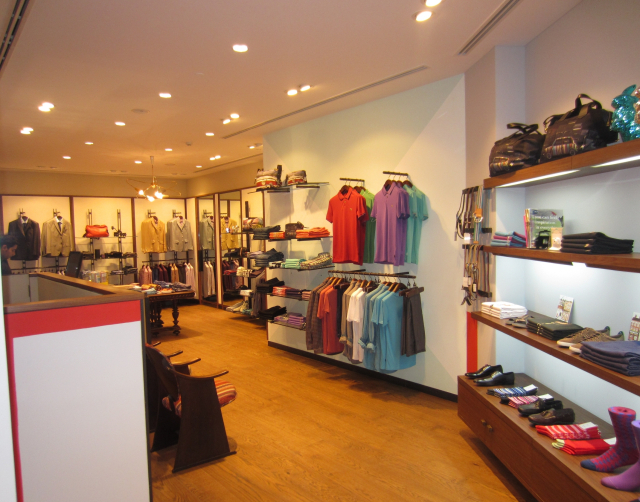 After Delhi and Bangalore, Paul Smith is now open at Palladium Annex. For those of you wondering, Palladium Annex is the grand space that connects the art deco Palladium mall to the Shangri La hotel. The shop offers all Paul Smith men’s collections including Mainline, PS, London Line and Jeans alongside shoes, accessories, fragrance and the interesting objects synonymous with Paul Smith. This 750 sq. feet menswear boutique bears the distinct Paul Smith DNA. The shop is clean and bright with a natural wooden floor and textured plaster panelled walls highlighted with a bright red border. Mid-century wooden furniture and contemporary glass shelving display bags and smaller items, all lit by a modernist brass Sputnik light. A welcome addition to Mumbai's luxury shopping scene.